Kickers say they only get noticed when they screw up, and just because that’s an old chestnut doesn’t mean it’s not painfully true. And Parkey, who donged a 43-yard potential game-winning field goal off the upright and the crossbar to send the Eagles to the divisional round with a 16-15 win and send the Bears home, has been noticed a lot this year. 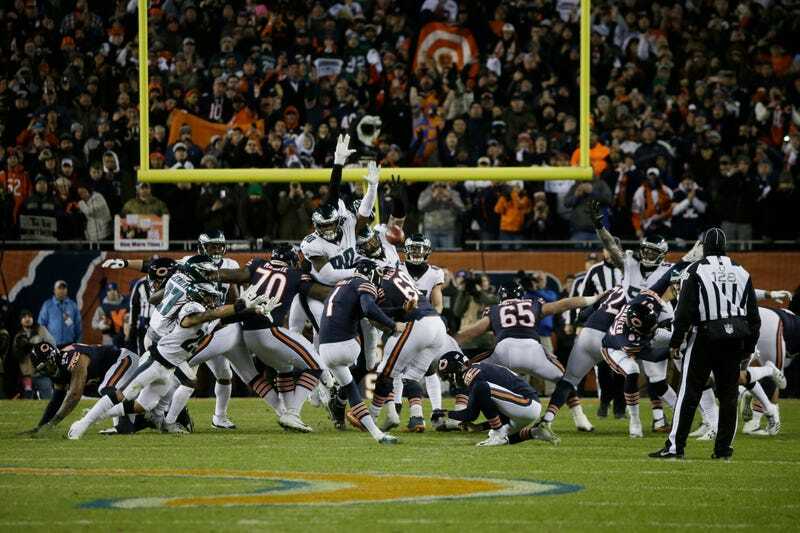 Parkey missed 10 kicks during the regular season (three of them extra points), including a Week 10 game against the Lions in which he hit the uprights four separate times. How bad did things get? That week, Parkey mentioned he was going to take some nighttime practice kicks, so a local news station dispatched a helicopter to Soldier Field, before the Bears invoked the rules on filming practice and forced the station to take down the footage. But Parkey had nailed 10 of 11 field goals to close the season, and his first three in this one. For one final missed kick to be the thing that undid a promising Bears season, and the only thing people will eventually remember from this game, and for it to be the damn upright again—well, that’s a feeling only kickers know. Afterward, Parkey gamely faced the media when he surely would’ve rather been literally anywhere else. And he was about as sanguine as it’s possible to be in a situation like this. Almost certainly, it’s not just one reason. A placekick is a Rube Goldberg machine just waiting to collapse, and if any one of the series of required mechanics is just a little imprecise, the whole thing can full apart. In this case, according to former NFL punter Chris Kluwe, Parkey planted his left foot too close to the ball, forcing him to kick ever-so-slightly to the left, across his body instead of straight through. There’s another angle here, though. Though no one noticed it at the time, Eagles DT Treyvon Hester got a hand on the ball. I can’t tell you if it mattered, or which way the ball might’ve hooked or sliced without the contact, but there’s no disputing it that there was contact. Even if the ball’s trajectory and spin didn’t appear to change, on the slow-motion replays you can see Hester’s glove whip back as the ball passes. Even Hester wasn’t sure if he made solid enough contact to make a difference. A matter of micrometers, then. It might have meant nothing, or everything. Because nobody wins or loses a football game on their own. This one required a cascading series of what-ifs, each with the potential to change everything thereafter. What if the bizarre catch-fumble at the end of the first half had been called correctly on the field? 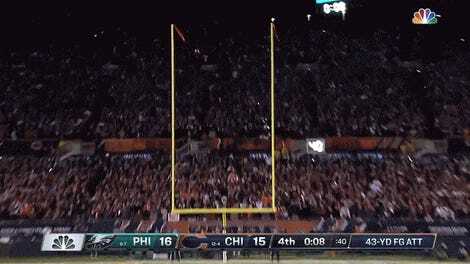 What if the Bears hadn’t had only 10 men on the field for the Eagles’ first touchdown? What if they hadn’t biffed a short punt to give the Eagles prime field position for their final drive? What if they had held stout on fourth-and-goal? What if Parkey hadn’t been iced by a timeout and his first kick would have counted? What if his mechanics had been slightly better, or the wind slightly less? What if Hester hadn’t gotten half a fingertip on Parkey’s kick? Bears fans have to live with each and every regret, while Parkey has just the one play. If anything, that makes it all the harder.